The focus was entirely on The Simpsons tonight—no other shows aired new episodes. And having just finished it, albeit a little late, I can't shake the feeling that this was a really odd outing. It wasn't particularly funny, not particularly unfunny, just sort of a mindless exercise. A pretty unnecessary episode in so many ways. I have a theory about the episode, but first a brief recap: Moe, and his bar, are at the forefront of the action. One summery afternoon, Moe confides in his barfly buddies that he's been doing a bit of online dating/chatting while at the public library. He's met someone, actually, named Maya. She's cute, she laughs at Moe's jokes, and she's keen on meeting Moe himself—not some photoshopped picture, however dapper. It turns out, though, that she is a "little person" (her words), which doesn't really bother Moe that much. But it sure does make everyone around the couple feel a bit uncomfortable, as they're not quite sure what to say and how to act. For a while, this dance continues—Moe continues to take her out and introduce her to his friends, but warns them ahead of time about the situation; they inevitably make some sort of gaffe, but overall everything is fine. That is, until Moe decides to propose, and through a string of ensuing jokes make it clear that he's also one of those awkward always-trying-to-be-PC guys. Maya wants someone to love her for her, and not despite her size, so she leaves—even though Moe was willing to chop off some of his height to win her back. Homer plays a key role in all this, not only initially as Moe's soul confidant, but because of an observation Marge makes at the beginning: He ignores Maggie, rarely showing her much attention/affection. To right this, he is sent out to spend the day with her, but this just ends with dropping her off at a playground next to Moe's and going inside to drink. This particular playground, it turns out, is populated by bullies who beat up on newcomers for doing, apparently, nothing. Marge suspects something is up when Maggie starts freaking out at home—from fear of a baby pounding around any corner—and decides to spy on Homer using a hidden nanny cam type deal. So back to that theory. Here we have an episode with very few gags, but a clear character focus. The potential for greatness is there, but rather than focusing the plot—and the jokes, because, as I've said, comedy can't exist in a vacuum—on Moe, Maggie, and Homer, instead much of the episode is about the other things happening to them. Almost every scene Moe was in included Maya, and all of those were just a string of somewhat uncomfortable bait-and-switch moments where you think the guy is talking about her height, but no, he's talking about something else. (Homer wants to discuss the "mechanics" of something, but it's nuclear power. Get it? Mechanics?) Maggie is being bullied for no reason, and it's demonstrated through a bunch of shots of babies using, well, baby things as weapons. Then Homer, who didn't even remember Maggie's name at the beginning, rushes in to protect Maggie, then wins "Father Of The Year" in Marge's eyes. Since this was a character-heavy episode, and much of the humor didn't revolve around the characters, most everything fell flat. Finishing with Moe's revelation—that hey, at least he put himself out there—was a nice touch. If only it was a moment that had been earned, or had at least been a joy to see unfold. Hey, it's Dr. Nick! Too bad everything about his appearance smacked of familiarity: "No competent Dr. would consider this." [Cut to Dr. Nick.] Also, no "Hi, Everybody!"? 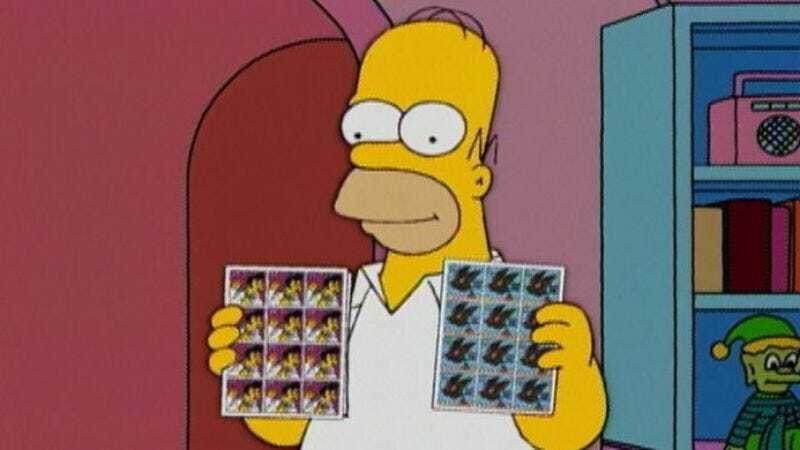 The Simpsons have stamps now! Or, soon. Stay tuned.